On June 6th, Dairy Farmers of Canada (DFC) coordinated with members of the federal Liberal caucus to attend a farm tour hosted by the Bühlmann and the Kuratli families of Sonibrand Farms Inc. Located 45 minutes from Parliament Hill, the Bühlmanns and the Kuratlis own and operate a modern dairy farm, milking 100 cows with two robotic milkers. The tour was intended to be the first in a series for all major parties in this 42nd Canadian parliament, designed to showcase Canadian dairy farms and farm families to our federal MPs. To help plan the event, DFC partnered with Francis Drouin, MP for Glengarry-Prescott-Russell, and a member of the House Agriculture Committee. With Mr. Drouin’s support, we were able to bring in Liberal MPs from both urban and rural ridings in Ontario, Quebec, and New Brunswick. In addition to Mr. Drouin, the group included: Agriculture Committee Chair Pat Finnigan; Agriculture Committee member MP Alaina Lockhart; Liberal National Rural Caucus Chair Mike Bossio; and MPs Brenda Shannahan, and Julie Dabrusin. In advance of the tour, I accompanied Guy Seguin, DFC’s Assistant Director of Policy and Dairy Production, on a scouting trip of six farms located in the Glengarry-Prescott-Russell riding. Guy and I visited many beautiful farms before visiting Sonibrand. This scouting trip allowed me to see six different farms in action, with a very knowledgeable tour guide (thanks Guy! ), and meet some incredible farm families along the way. It was invaluable for me to have the opportunity to not only visit many different types of farms, but to hear what the farmers themselves have to say about the issues affecting them the most. On the morning of the tour, DFC sent a bus to Parliament Hill to pick up the MPs. DFC’s Executive Director, Caroline Emond, had an opportunity to speak with MPs and answer questions about some of our most pressing issues. On the bus ride, MPs frequently mentioned how impressed they were with the presence of so many farmers representing all provinces at the June 2nd rally on Parliament Hill. When we arrived on the farm, MPs were greeted by Rene and Sonja Bühlmann, two of the four co-owners of Sonibrand. The MPs visited the barn, and had an opportunity to watch the robotic milkers in action. The Bühlmann family were very gracious hosts, and spoke eloquently about the challenges and investments needed to run a modern dairy farm – as well as the stability and strength that Canada’s supply managed system provides our dairy farmers, especially in comparison with the rest of the world at the moment. The Bühlmann’s also spoke about the importance of sustainability in the dairy industry to farmers and consumers, and used the opportunity to offer a run-down on the six modules of proAction®. 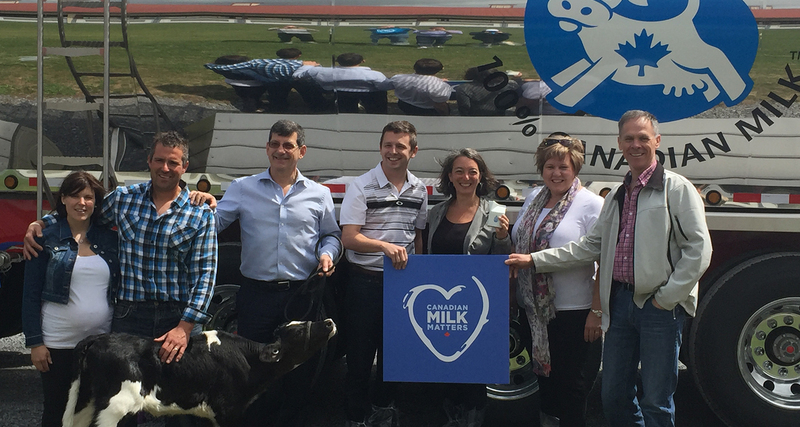 At the end of the tour, MPs took the opportunity to take photos with a calf in front of a new milk truck – while holding a “Canadian Milk Matters” sign. Standing smiling alongside the Bühlmann’s for the photo, it was very apparent that the attending MPs were clearly happy to support Canadian dairy. Judging by the many questions asked on the tour, I am certain that they learned something too! On the bus ride home, the MPs that attended expressed a lot of gratitude for the opportunity the Bühlmann’s gave them to visit their farm. We encouraged them to tweet their photos with the hashtag #cowmoment, and to tell their colleagues about all they had seen and experienced. The MPs unanimously encouraged DFC to organize more of these tours for MPs from all parties. I have found, these tours are a great way to increase awareness among parliamentarians from all parties, whether they are from rural or urban ridings, as to what a Canadian dairy farm is all about. 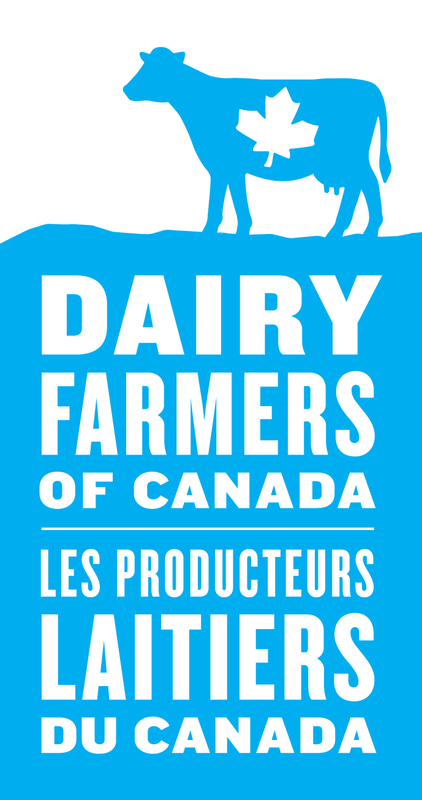 In order to encourage government action on the issues affecting Canadian dairy farmers, it is critically important that our parliamentarians see first-hand the amount of work and investment needed to run a dairy farm in Canada; and all that goes in to the operation of a family-owned farm business. We are very eager to continue these tours with members of all parties. The more MPs we can bring to the farm, the more we add to their understanding – and the more they can relate to the challenges impacting the industry. Sometimes you have to see something with your own eyes before you can truly comprehend where someone is coming from; I am sure that all of the MPs that joined us on the farm tour can certainly see where Canadian dairy farmers are coming from now.